Michael was hired by Metro West in April 2017. His new position as an EMT marked an official milestone in his life—he was transitioning into EMS following four years of service as an active duty U.S. Marine. The transition between professions was seamless, though, as Michael applied the same levels of commitment, enthusiasm, responsibility, and dependability that he acquired while serving as a Marine. One of Michael’s most commendable traits, simply put, is his willingness to work. Michael would begin every workweek looking for gaps in the weekly shift schedule, then he’d request to pick up the extra shifts, in addition to his own full-time schedule. If coverage was needed for an early transport or out-of-town movement, Michael was on it. During the 2017 wild land firefighter season, Michael was constantly picking up extra shifts to provide coverage for EMTs who were either contracted out as wild land firefighters or were volunteering with separate fire agencies. It was Michael’s outstanding work ethic that catapulted him into a full-time position on a medic unit. Michael continues to push himself as both a professional and a student as he pursues new and additional career opportunities. He earned a Tactical Combat Casualty Care certification and completed Secfor International’s challenging High Risk Medic program in November 2017. He has undoubtedly raised the bar and set a new standard of excellence that is expected of new hires. Michael is always quick to acknowledge the support, flexibility, and encouragement he receives from his supervisors, partner, dispatchers, family, and his new fiancée. 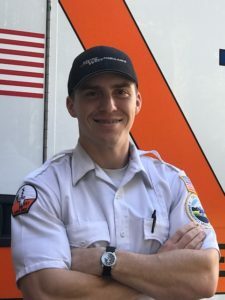 Metro West Ambulance is nominating Michael as a Star of Life for his incredible work ethic, consistently professional demeanor, and his adaptive personality.